Providing you the best range of n p k 19:19:19 (marvel) fertilizer, npk 13:00:43 ( marvel gold) fertilizer, zinc edta 12% (micro magic) and chelated mix micronutrients edta (micro marshal) with effective & timely delivery. With the customer focused approach and vast industrial experience, we are providing a wide array of N P K 19:19:19 (Marvel) Fertilizer as required by our valued clients. These products are used to improve vegetative and reproductive activities in the plant system. In addition to this, these are processed using best quality ingredients at a well-equipped production unit. Pack Size 100 gm - 1 kg. 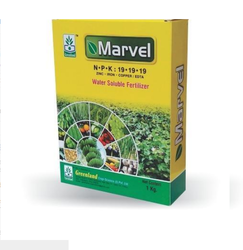 Banking on the skills of well-qualified and experienced professionals, we are presenting a high-quality range of NPK 13:00:43 (Marvel Gold) Fertilizer to the clients. The offered products are the leader potassium source for all growth stages with additional nitrate nitrogen for quick absorption by the plant. Keeping in mind the assorted needs and demands of the customers, we are also offering these products in various packaging options. Pack Size 100 ml - 1 ltr. Our organisation set a benchmark in the industry by providing a wide gamut of Zinc EDTA 12% (Micro Magic) in the market. The offered quality approved collections of products are used as Drip Irrigation as well as through foliar applications to correct deficiencies & other hydroponic applications in agriculture & horticulture sectors. We are widely known for the timely delivery of these products as well. In order to satisfy the variegated demands of our valuable clients, we are offering them a perfect range of Chelated Mix Micronutrients EDTA (Micro Marshal). These are formulated as per the industry parameters using pure quality ingredients and latest technology and used in agriculture and horticulture as foliar feed in soil or hydroponics applications. Additionally, these are offered to the clients at very reasonable rates within the committed period of time.